Together, John Deere and The National FFA Organization shape students to be future ag leaders. It was 1943 and the second world war was at its peak. 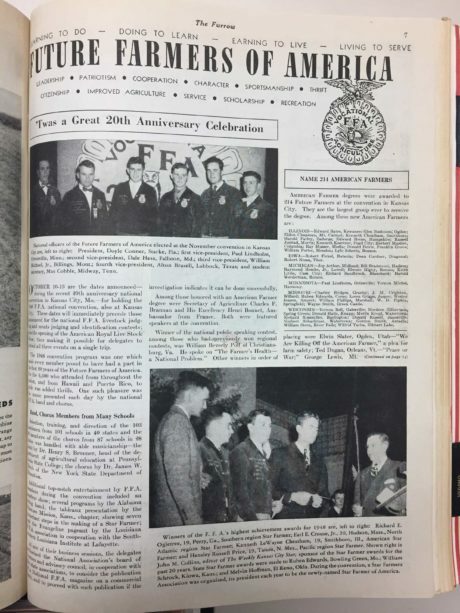 At the time, Future Farmers of America (FFA) boasted more than 100,000 members, including tens of thousands serving in the armed services at the time. Formed just 15 years earlier, FFA’s purpose was to educate youth in agricultural fields of study. 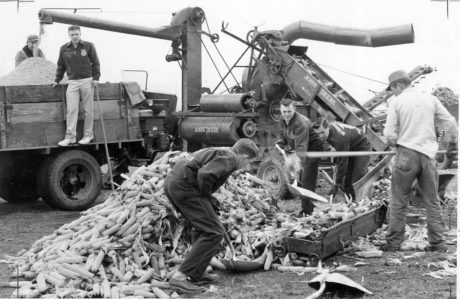 Meanwhile, like other U.S. manufacturers, Deere & Company had become proficient in making goods for the war effort, including military tractors, ammunition, aircraft parts, and cargo and mobile laundry units. The John Deere Battalion, comprised of employees and dealers, was serving their country by repairing tanks in Belgium and France. 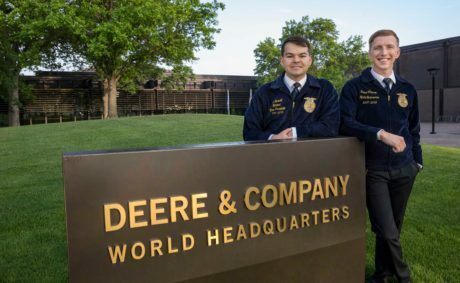 Yet against this backdrop of chaos and uncertainty, Deere & Company was resolute in making a $1,000 commitment to the FFA, becoming what would eventually be the youth organization’s longest running corporate sponsor. 2018 marks the 75th anniversary of that initial investment, a partnership that has never been more relevant. 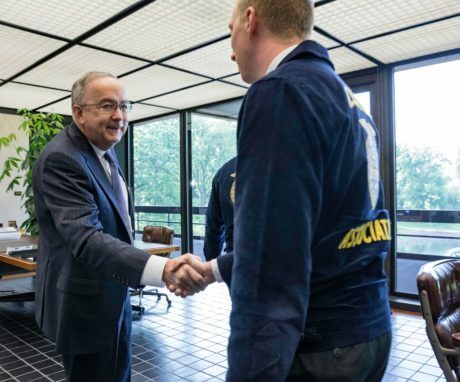 “Our support of FFA’s mission to prepare future generations for the challenges of feeding a growing global population has never wavered,” said Cory Reed, president, John Deere Financial, and a member of the National FFA Foundation Board of Trustees. “Through FFA, students learn by doing, and along the way, develop lifelong leadership skills and are exposed to a broad range of agricultural careers. I can’t think of a better cause for us to support than the future supply of leaders for our industry,” Reed added. Today, the National FFA Organization, as it’s now formally called, has 669,000 members, ages 12-21, in more than 8,000 chapters in all 50 U.S. states, Puerto Rico, and the U.S. Virgin Islands. Its mission has remained largely unchanged through the years: FFA makes a positive difference in the lives of students by developing their potential for premier leadership, personal growth, and career success through agricultural education. In FFA’s early days, John Deere furnished each newly-formed chapter with a model of a walking plow. As well, Deere’s farm magazine The Furrow devoted a page to FFA news in each monthly issue. Today, Deere sponsors a wide range of FFA activities, including the John Deere Dealer Scholarship Program and the Farm Business Management career development competition. 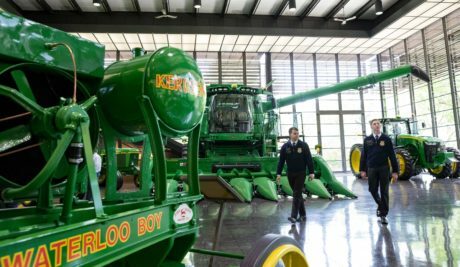 As a way to introduce FFA members to potential careers at John Deere, the company sponsored a virtual field trip to Waterloo Tractor Cab & Assembly Operations, in Waterloo, Iowa, in May. 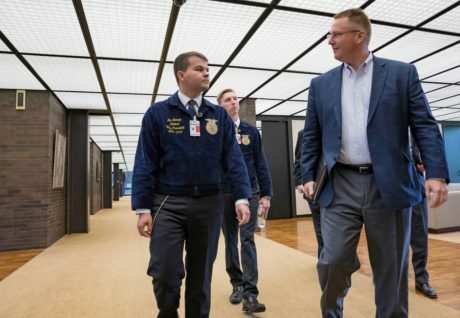 “Attended” by more than 44,000 students and educators, the event was live-streamed to FFA classrooms in 49 states, plus Canada, Algeria, and Rwanda. The field trip featured interviews with John Deere employees responsible for the design, manufacturing, and marketing of the company’s 8R Series Tractors. John Deere was one of the first corporate partners to form an FFA Alumni and Supporters Chapter in 2014. From an initial 13 charter members, the chapter today has around 400 members, largely concentrated in Iowa, Illinois, Kansas, North Carolina, and Wisconsin. Members engage with local student chapters through volunteer coaching and mentoring, training chapter officers, and judging competitions. “Many employees, especially those who are FFA alums, are extremely passionate about FFA,” said Steve Conrad, a founding member, and current president of the Alumni and Supporters Chapter. “They are committed to FFA and understand the critical need to develop future leaders and support ag education,” he added. Building on that initial $1,000 investment in 1943, John Deere today has contributed more than $13 million to FFA over the past 75 years. That commitment will likely continue long into the future. Check out additional citizenship-related stories about FFA.